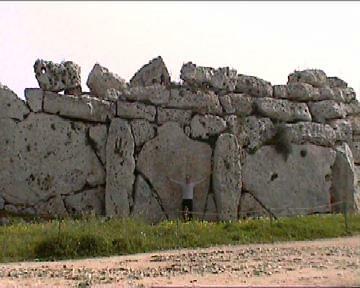 Ggantija: ('The Work of Giants'). 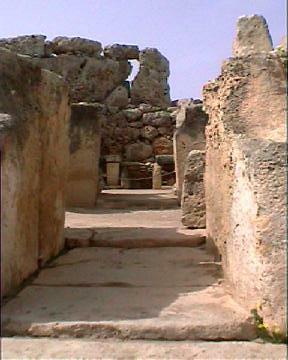 The Ggantija temples are amongst the oldest temple structures on Malta. 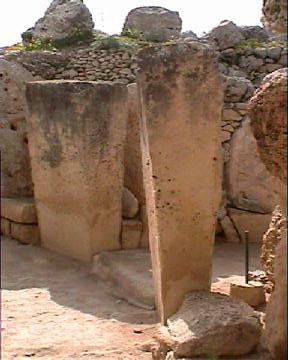 Once the most prominent site on Gozo Island. 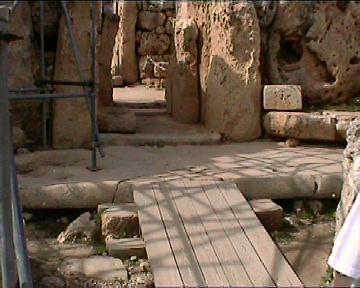 The importance of this temple complex is only now outweighed by the discovery of the 'Hypogeum II' within and below the nearby Xaghra Stone-Circle. 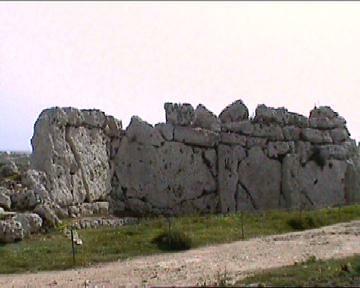 The Ggantija temples stand at the end of the Xaghra plateau, facing towards the south-east. They are amongst the earliest of series of temples built c. 3,600 - 3,000 BC. 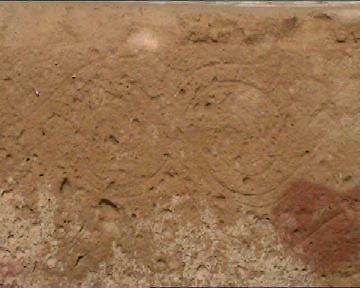 They were first excavated in 1827. The exterior was built of immense limestone blocks, placed in a distinctive style and covered with close fitting, horizontal limestone slabs rising to a height of 26ft at the front. Because the temple was built into a hill, the rear walls appear to be smaller from the outside. Malta is just visible between a notch in the horizon offering the suggesting that the temple was built where it was because of this (and the presence of several underground springs). 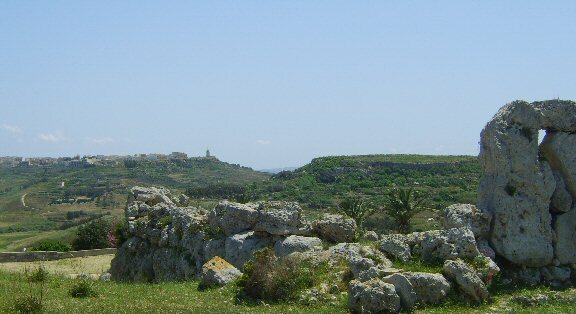 Malta can just be seen between the two hills directly in front of Ggantija. The temple complex was built 'into' the prehistoric landscape. 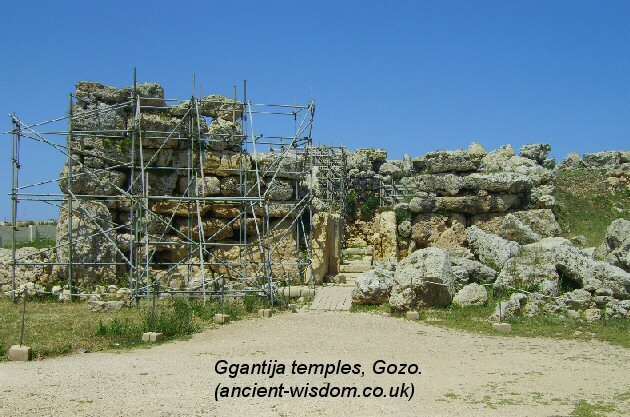 The largest stone at Ggantija measures 5m x 8m x 4m = 160m³ (50 tons). 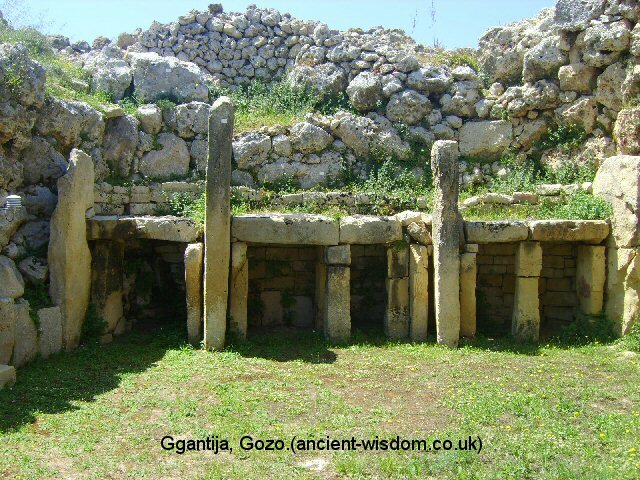 As at the Tarxien on Malta, a number of stone balls were discovered at the site and it is believed that they were used for manipulating and supporting the stones. 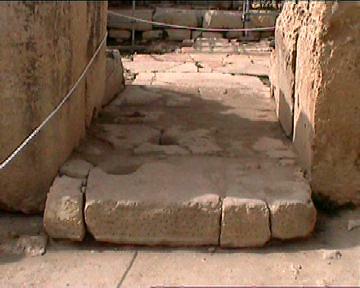 The massive floor slab at the entrance to the temple. 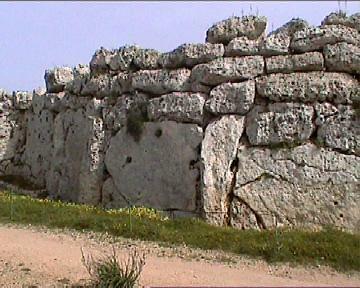 Many of the features common to the other Maltese temples can also be found here. 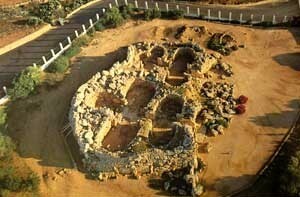 The southern temple is believed to be the older of the two, dating back to 3,600 BC (2), 3,400 (3). The smaller northern temple and the external facade have been dated to around 3,000 BC demonstrating their use over a long period of time. 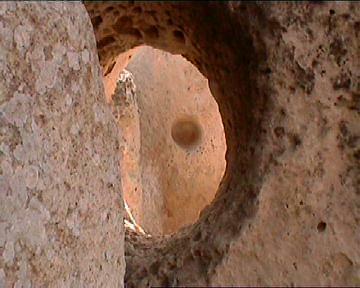 The walls of the temples rise to a height of six metres and are thought to have once been covered over. The interior walls are not built in the same style as at other temples, having a rough interior made of smaller, globulinous limestone chunks, and without internally curved walls. 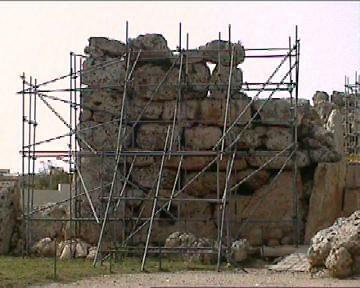 The rough walling of the temple interior was originally smoothed by an application of clay and coated with a thin layer of lime plaster. 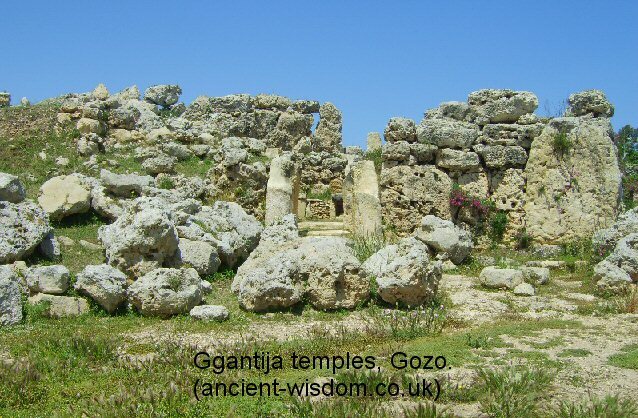 Noticeably, the Ggantija complex is the only site of its kind on Gozo, and significantly, it is twinned with the Xhagra circle, making the pair a classic example of the 'primal mound' / stone circle combination commonly seen at many other Western European Neolithic complexes. The deliberate orientation and placement of the temples is reminiscent of Maes Howe on the Orkneys. The temples are both orientated south-east with two slightly different azimuths (125° and 135°). The altar at the far end of the southern temple aligns to the winter solstice (see photo below), which would have simultaneously set between the notch made by the two level hills on the horizon.